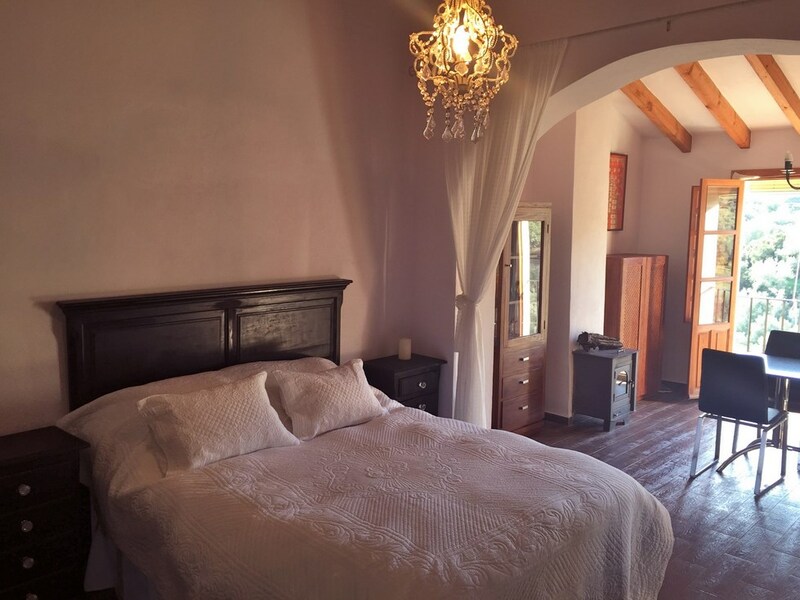 Those who read this will be familiar with those romantic, beautiful properties that appear in the country house magazines – this beautiful house is just that sort of place! 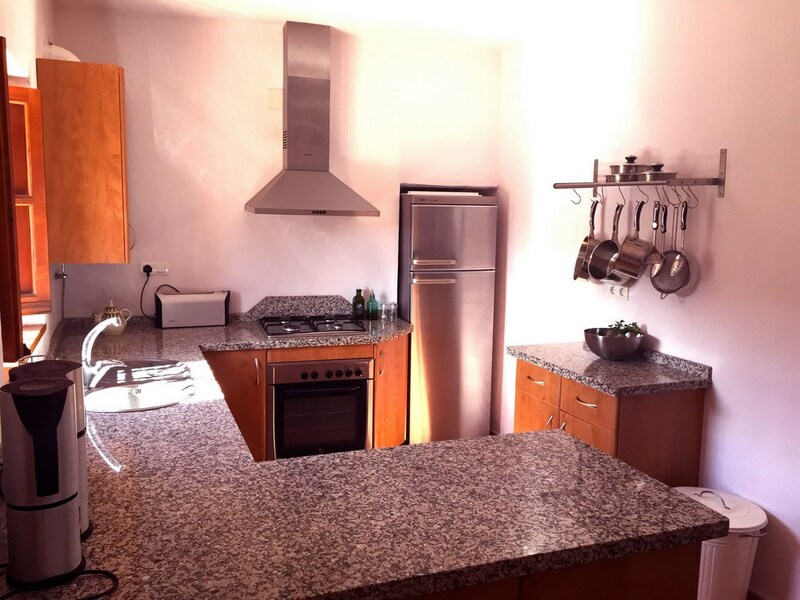 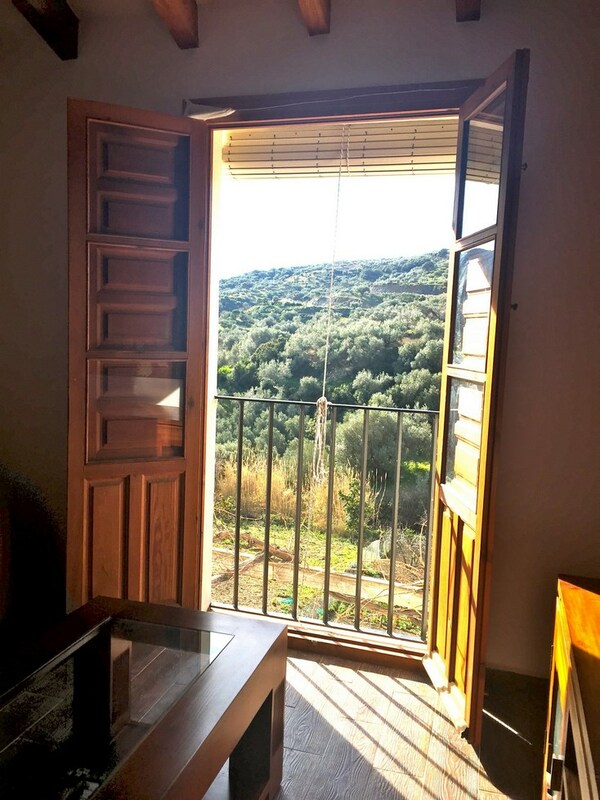 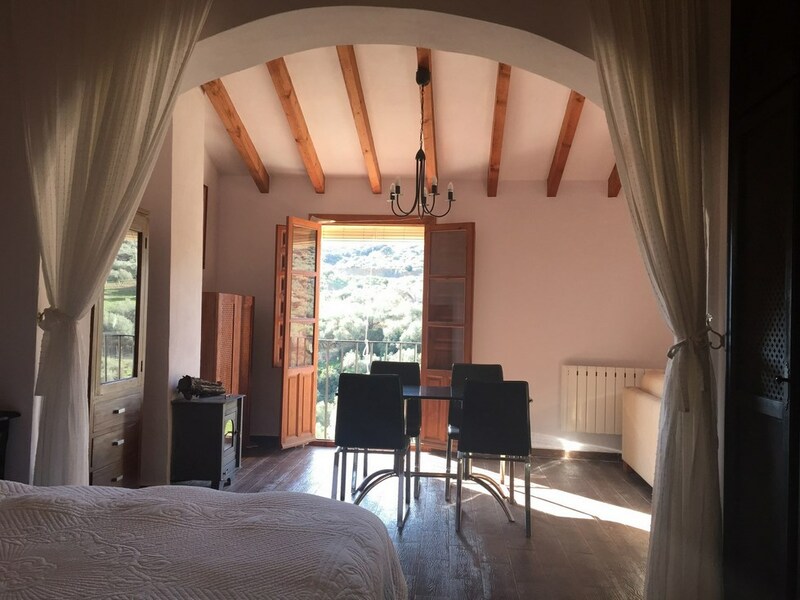 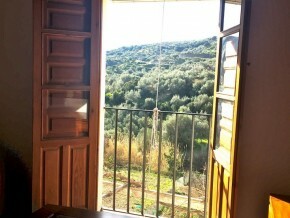 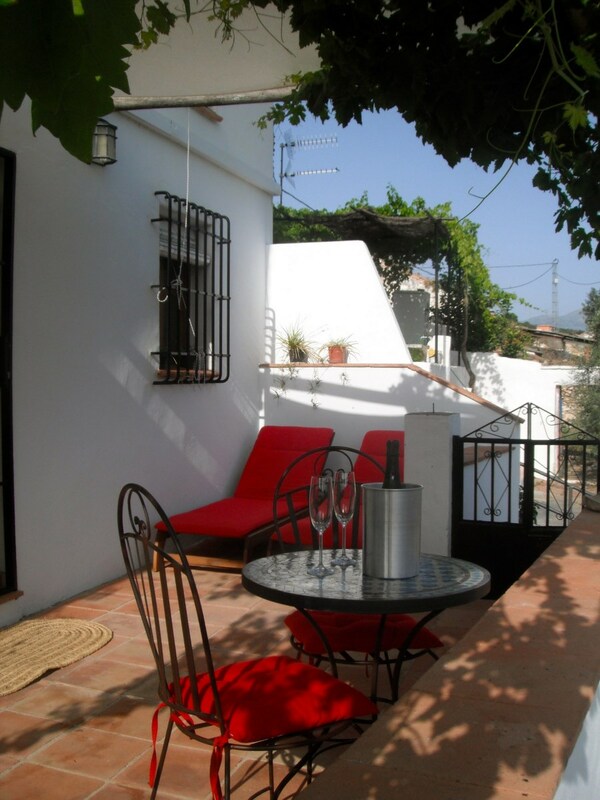 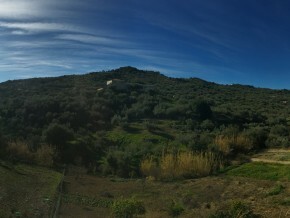 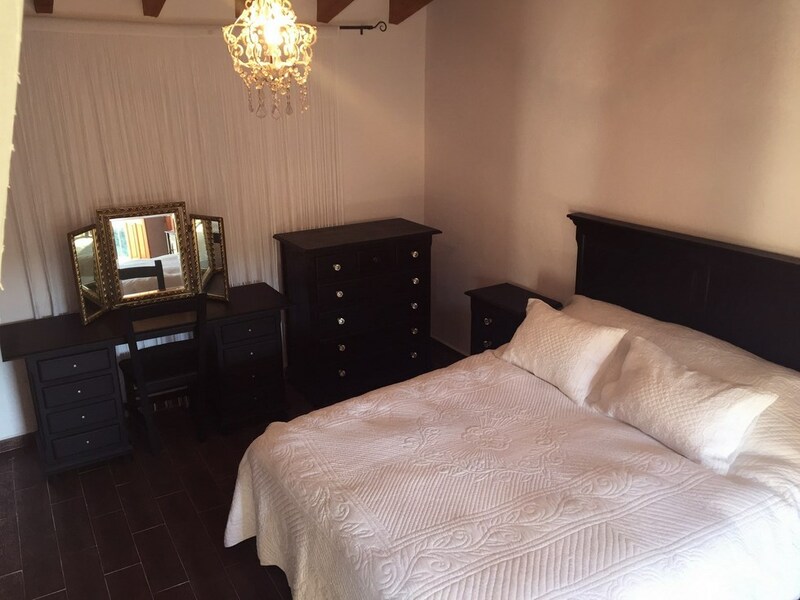 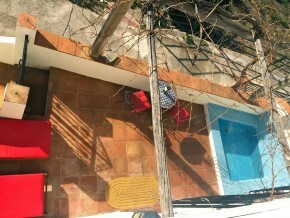 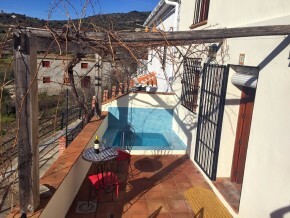 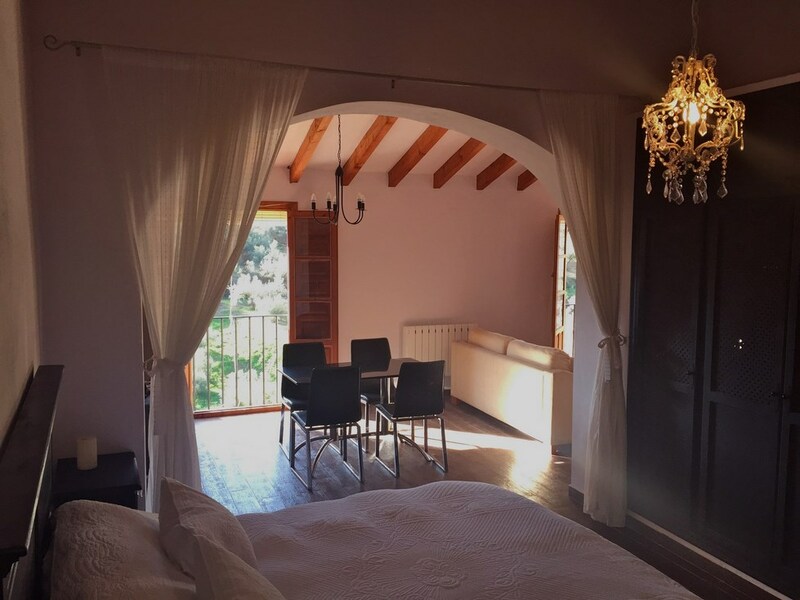 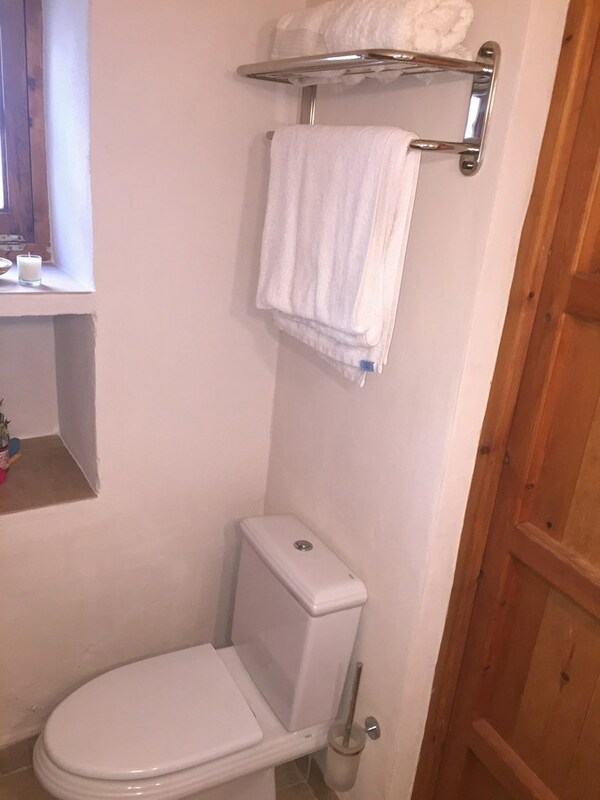 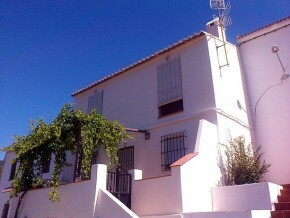 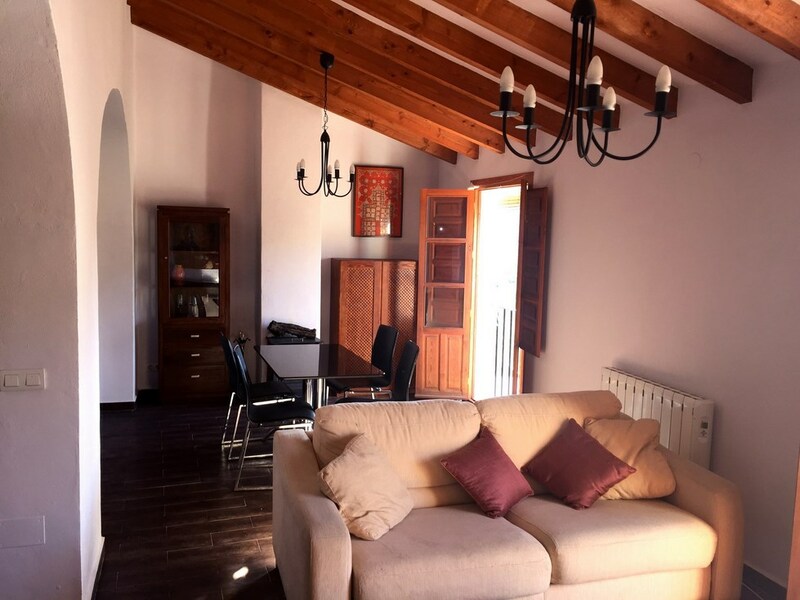 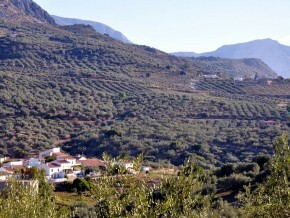 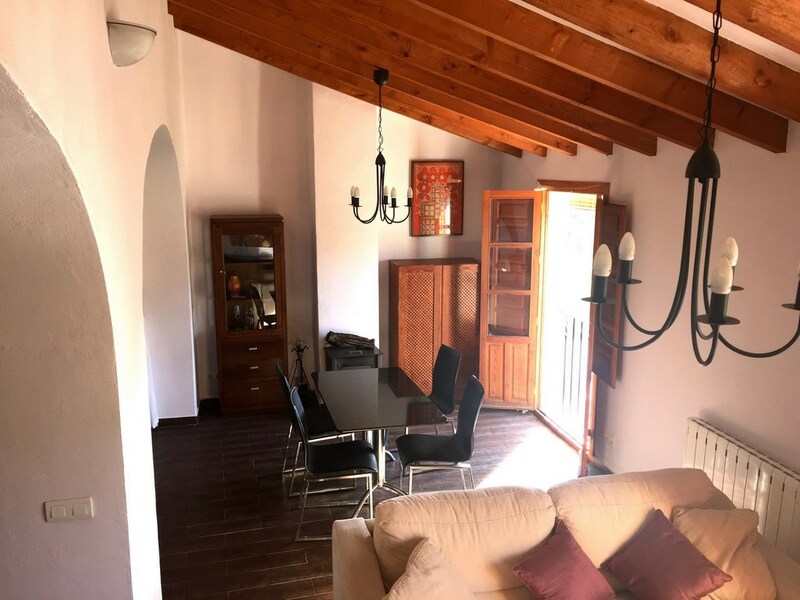 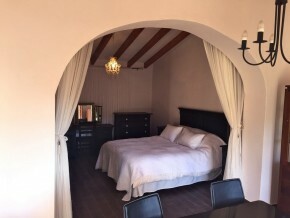 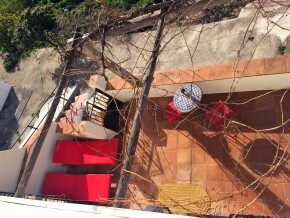 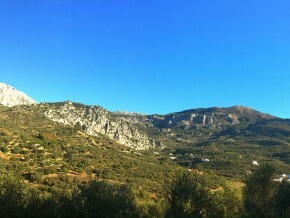 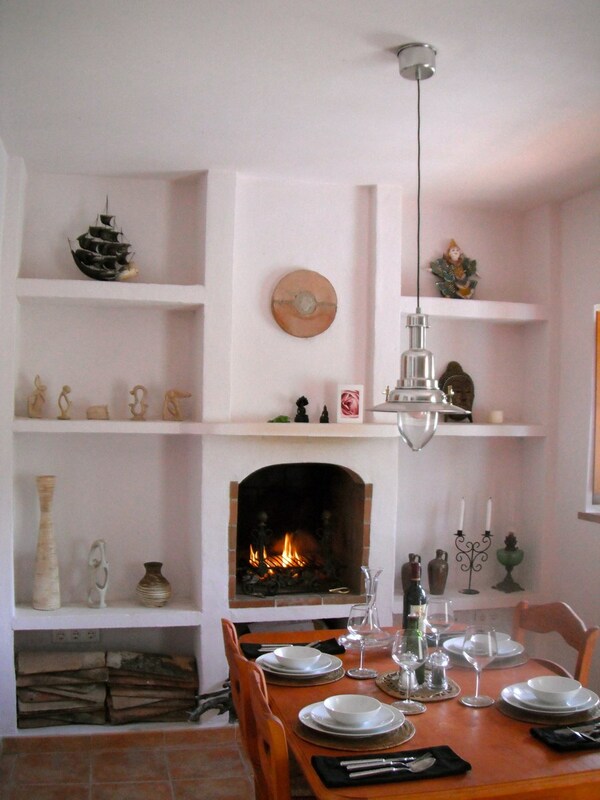 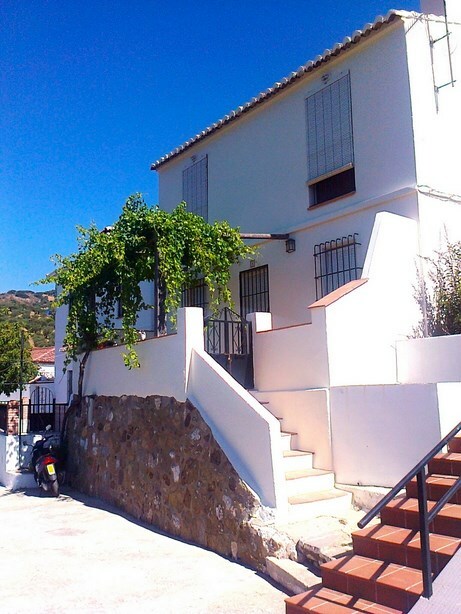 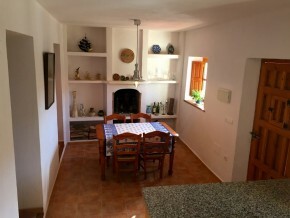 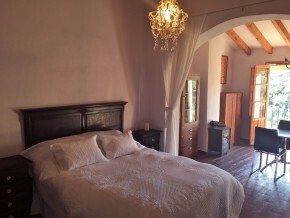 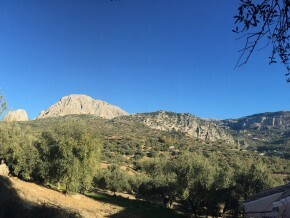 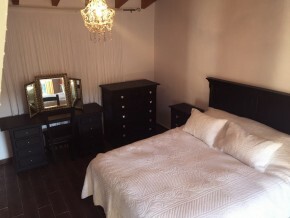 Located in a tiny country hamlet, just 5.5Kms from the lovely country town of Riogordo and within 40 minutes of Malaga and the airport, this delightful house offers excellent, quality accommodation and is ideal for anyone looking for a place to get away to, for holidays, weekends, Winter breaks, etc, and it also has excellent rental potential. 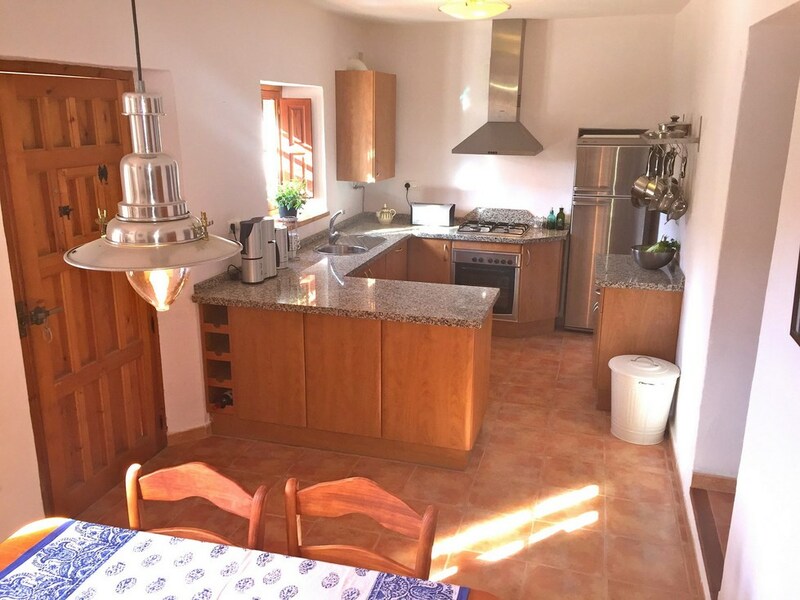 There is ample parking just a few seconds’ walk from the house, which is on the very edge of the hamlet facing directly South, with all-day sunshine. A few steps lead up onto the South facing terrace, a perfect place for outdoor dining, sunbathing and enjoying a glass of wine in the delightful, built-in splash pool at the far end of the terrace. 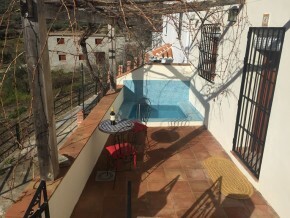 The terrace is 6 x 2.5m and the splash pool is around 1.5 x 1.5m with seating. 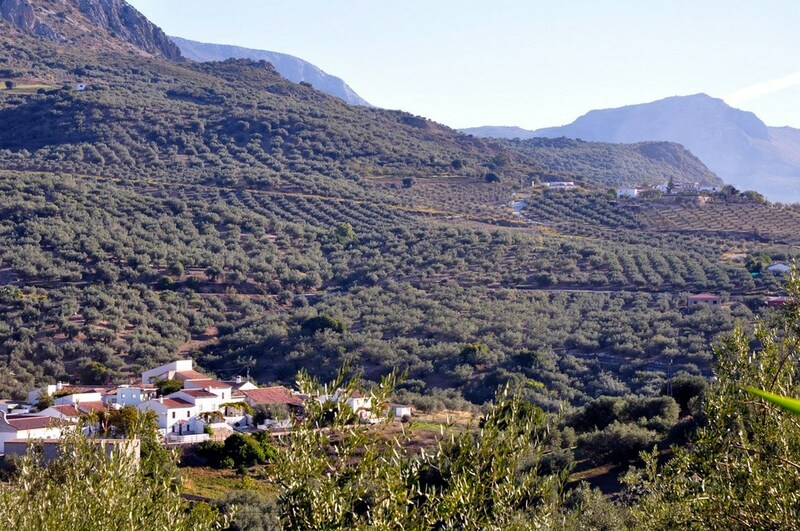 It has mature grapevines climbing over the area, offering an efficient natural shade in the Summer, and conveniently losing its leaves in Winter, bringing in the welcome warm sunshine in Winter! 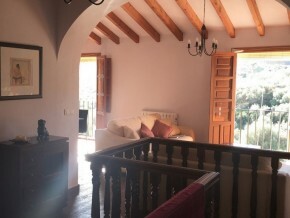 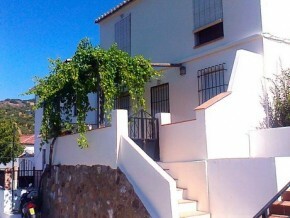 From the terrace, a wide, Andalusian style wooden front door leads into the downstairs living/dining room with kitchen. 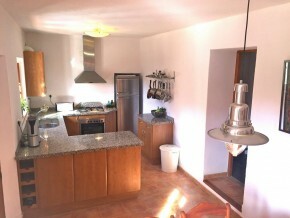 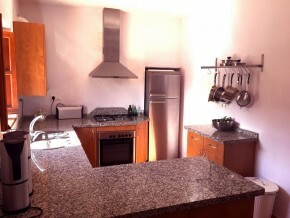 This area is 7.5 x 3m including an immaculate, quality fitted kitchen with integrated oven and dish washer. 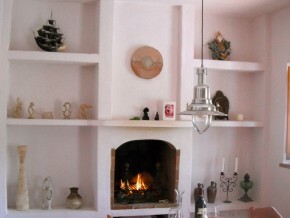 An original fireplace and surround guarantees cosy evenings in the few colder months of the year. 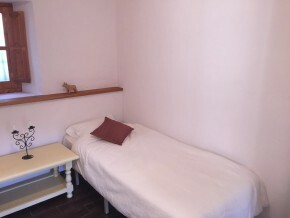 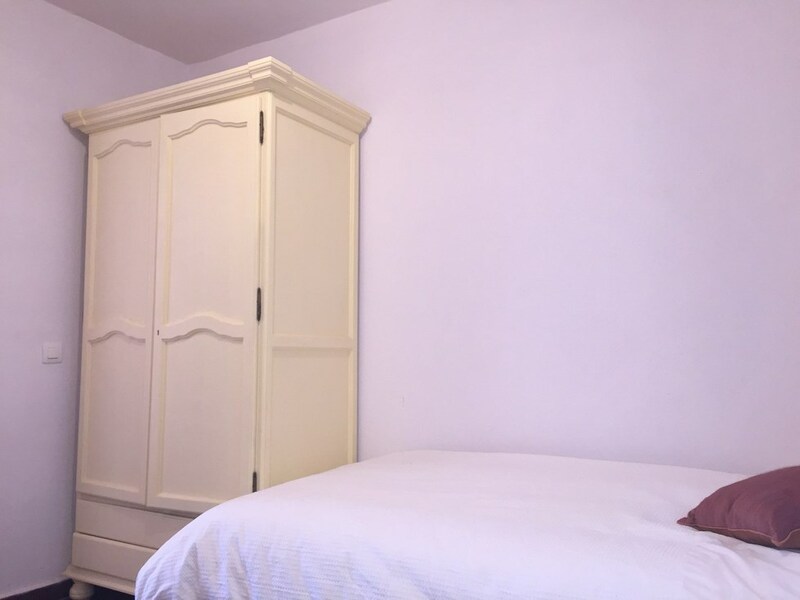 To the right, a door leads into the downstairs double bedroom (3.5 x 3m), currently furnished with two single beds. 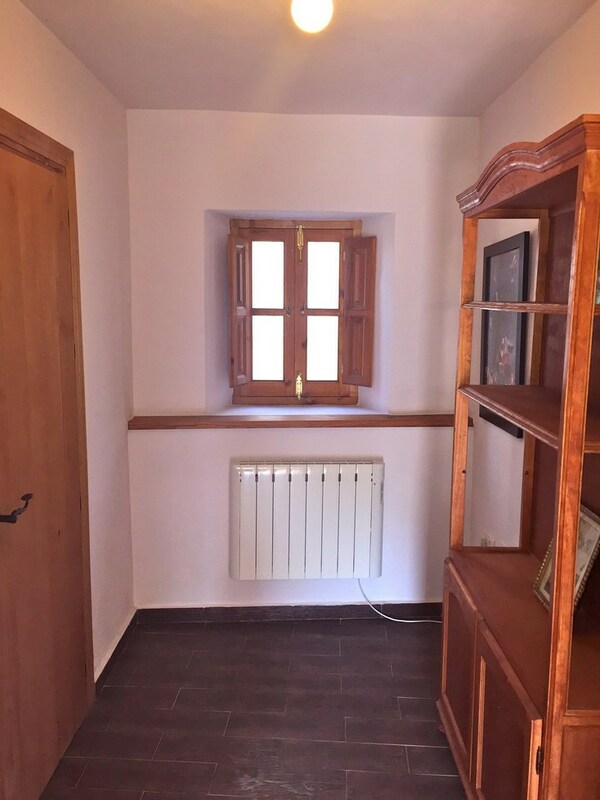 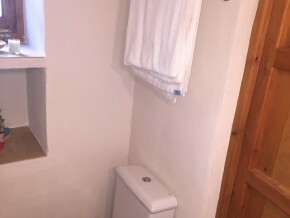 And to the left, an opening leads into an inner hallway area with quality economical wall mounted electric radiator and a lovely additional space to this beautiful house. 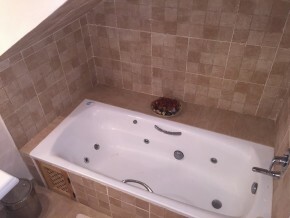 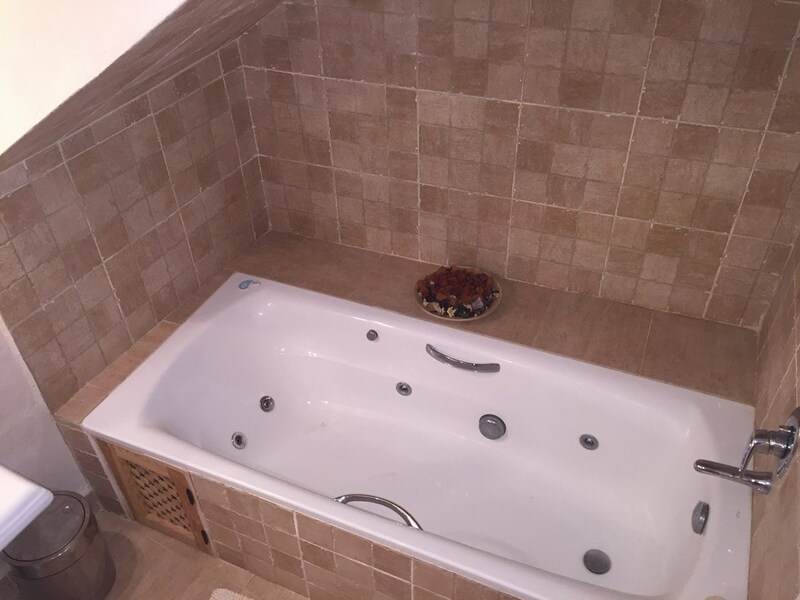 From here a door leads into the bathroom (2.5 x 2m) with a luxury, large jacuzzi style bath. 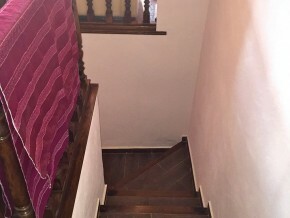 Stairs lead up from the inner hallway. 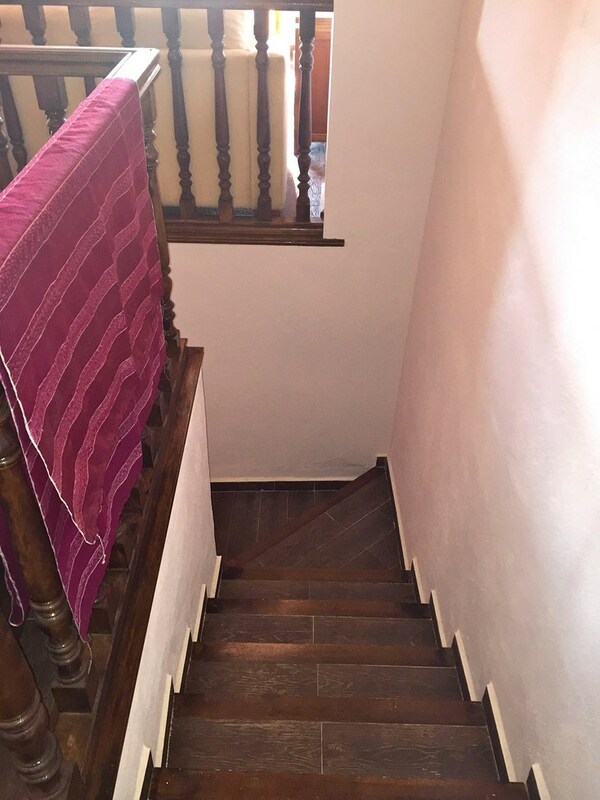 The open stairwell leads into the large open plan upper level, and immediately into a 4×4 landing area including the stairwell. 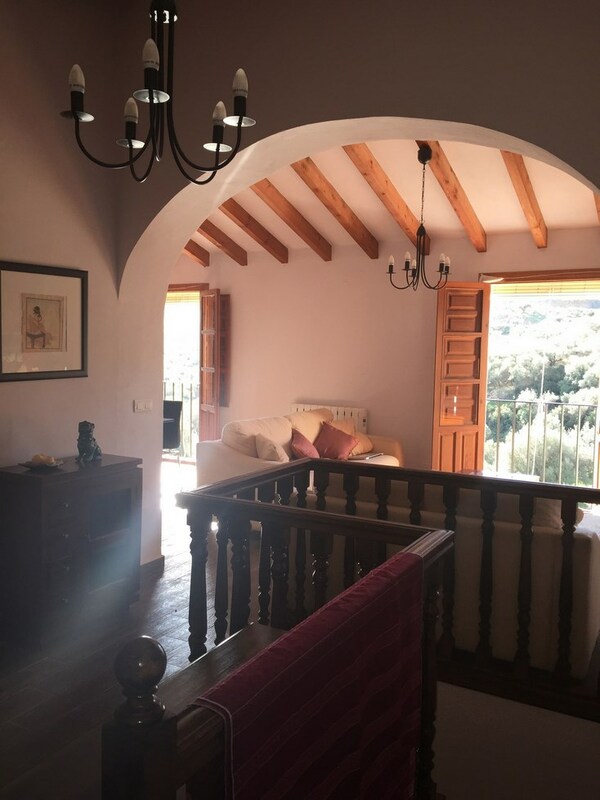 This area opens out into a stunning upper living room area of 8 x 3m, with sloping celing with beams, and two sets of double wooden balcony doors overlooking the delightful views of the countryside due South. 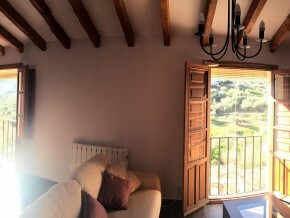 The sunshine streams though the doors to bring plenty of light into this comfortable and stylish living area. 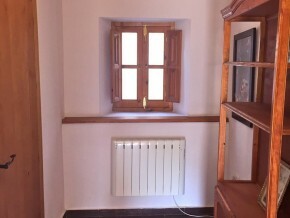 There is a second wall mounted radiator and a woodburner. To the far end of this room is a wide, high archway leading into bedroom 2. 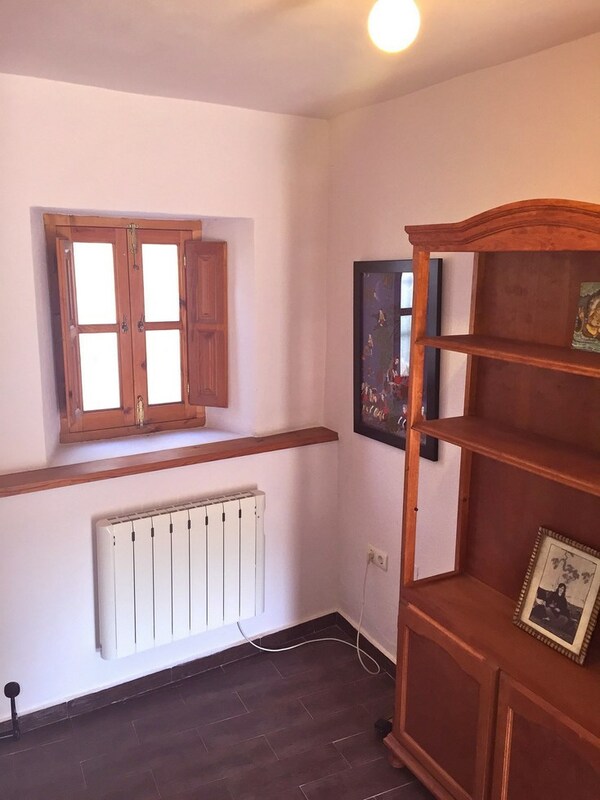 This lovely room is 4.25 x 4m, including a built-in rustic style wardrobe. 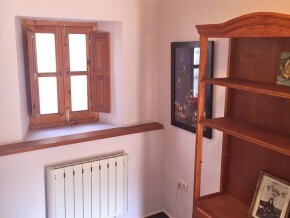 At the moment this room is an integral part of the living room area on this floor, but as there is a connecting door from this bedroom directly out to the open stairwell landing, and an outer wall which could be fitted with a window, meaning that it would be perfectly possible to close the archway and make this room completely separate from the living area. Alternatively, glass panels and curtains could be fitted into the archway space, to offer the flexibility of closing off the bedroom or having it open to the living area. 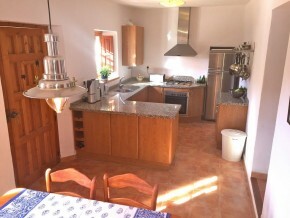 A stunning, quality, lifestyle house in an enchanting country location! 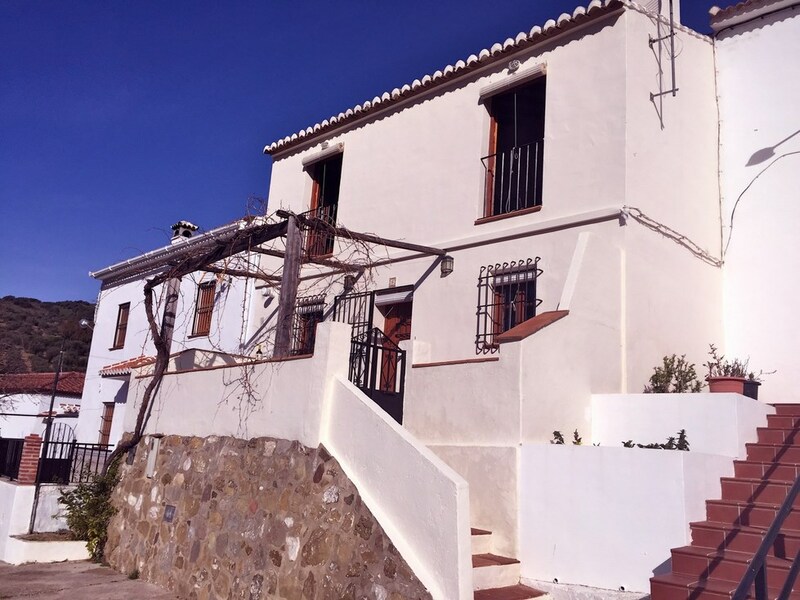 IBI /council tax: 100 Euros per annum approx.